Although these numbers are interesting enough on their own, I bring them up to emphasize the importance of the street grid in determining the balance of buildable to non-buildable land. Even the difference in unbuilt area between the downtowns most dominated by surface lots, and those most built out, as is the case for Houston and Washington, is no greater than the difference between Washington and the European cities with the most generous street allotments – the Paris of Haussmann, with its broad boulevards, imperial Vienna of the 19th century, and Barcelona's Eixample, all of which devote around 25 percent of their area to streets. It is difficult to imagine a justification for much exceeding the 25 percent figure. Many cities of similar size and far larger than those just mentioned make do with less, including Tokyo, Mexico City and Buenos Aires, while accommodating extensive mass transit systems. The traditional city of narrow streets and small squares, typified by towns of medieval plan, find ten or fifteen percent perfectly adequate. In addition to their transportation function, streets can also be understood as a means of extracting value from underserved parcels of land. The street removes a certain amount of property from tax rolls in exchange for plugging the adjacent land in to the citywide transportation network. Access to the network, in turn, increases the value of the land for almost all uses. For the process to satisfy a cost/benefit analysis, the value added should exceed that lost to the area of the streets plus the cost of maintenance. (This implies rapidly diminishing returns for increasingly wide streets, and helps explain why, in the absence of mandated minimum widths, most streets are made to be fairly narrow.) For many of the gridded American cities of the 19th century, as I've written about before, planners failed to meet these objectives, although these decisions have long since been overshadowed by those of their 20th century successors. 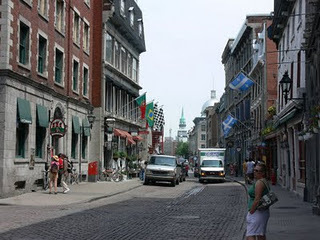 30-foot street in Montreal (Flickr/dumbo65). The result, most notably in Portland, which devoted over 40 percent of its initial grid to streets, was simply to reduce the maintenance budget to zero, and to leave the streets a sea of mud. This in turn resulted in a street network that was unsuited to any form of transportation, but particularly to walking (the late 19th century American city, despite the claims of some, was not a pedestrian's paradise). For Portland to have attained the 25 percent figure would have required streets of 30 feet rather than 60. At that average width, it is likelier that paving would have been within the financial reach of the city of that era. Still, it is difficult to conceive of a more wasteful pattern than modern Houston's, where redundant wide streets, and their associated infrastructure, are paved and maintained to serve dozens of vacant parcels. Each new office tower, meanwhile, spawns hundreds of acres of tract housing on the city's periphery, as lots a few blocks away sit vacant on high-rise speculation. The one blessing in disguise of the form of a city like Houston or Little Rock is that it can allow planners a relatively free hand to reshape the existing street network. Houston has in fact taken some halting steps in favor of more pedestrian-friendly streets, and planners like Christof Spieler have in mind truly urban visions for building out the remainder of the downtown. It would be disappointing to say the least if these downtowns are eventually rebuilt and revitalized without rethinking the street plan itself. By 1894 much of central Portland had been paved, although it looks like the majority of the eastern section of the city was merely graveled. The city has an 1894 paving map on its site - I'll ask you to google "portland paving map" to avoid being spam-filtered. I'm not very familiar with Portland, but my understanding is that much of the outlying neighborhoods developed in the 20s, so I'd guess that the area that wasn't yet paved in 1894 was fairly sparsely developed. Not that this disproves your point, I just thought it was interesting. Yes, sorry for the spam filter. There does not seem to be a way to turn it off, at least not that I've found. Thanks for pointing me to that link, though. Urban paving seems to have really taken off around 1890-1910. The paving here is really a side issue for historical interest, although today I suppose it does still affect the extent to which a city can provide funding for a paved surface more attractive than blacktop. Still, it appears Portland went without paving for about 35-45 years following its founding. Also, later blocks outside the downtown were made larger, reducing the amount of street acreage per square mile, and indicating that an extension of the downtown street/built area ratio wasn't seen as desirable. Your work reminds me of Norm Garrick's at UCONN. What's interesting is the change over time and how the roads slashed through the city to create the parking desert. I collected some older Photos of Houston after seeing Norm's imagery in the second post. It would also be edifying to classify the percentage of on-street parking. For instance, almost all streets in downtown DC have two lanes of on-street parking, and maybe half the streets have just two travel lanes. That would imply the area devoted to traveling vehicles is something more like 1/3 instead of 44%. It makes a difference because a lane of on-street parking is a lot more amenable to adjacent walking and lingering activity than a lane of moving traffic. Also curious if the street area percentages include the sidewalk, or if they just measure the curb-to-curb width. Great post with great work. I can dream about an atlas that provides these statistics for all of the world's major cities. @Pantograph: yes, this is very much inspired by the work of Garrick and McCahill, whose studies I featured in a post last week, but the work as I've said is mostly that of the contributors as Skyscraper Page, which I've simply edited and added to. As for changes over time, I've heard it said that downtown Houston in the mid/late 70s had around 35% surface parking, so things seem to have come a long ways since then. @Laurence: Thanks for the nice words. 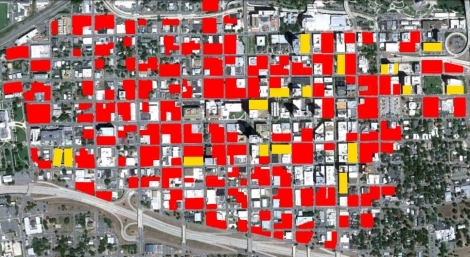 Calculating on-street parking could be done as well, although it can be difficult to see and confirm in aerial views. I agree it would be interesting to have that information, though, perhaps expressed as the percentage of sidewalk length adjoined by on-street parking or by some other means. As for street area, I've clarified in the post that it does include the sidewalk (I am using the same figures as in the earlier post, which included the entire right-of-way, not just the roadbed). It may be possible to break out a separate figure for sidewalks -- I'll try later today. Also, the closest thing to an urban statistical atlas that I'm aware of is Allan Jacobs' "Great Streets." He does, I think, calculate intersection density in the book, but not if I'm remembering right ground coverage of buildings, street area, parking, or any of those statistics (although some can be inferred from drawings). The trouble with all these exercises is how to treat parking garages. If you can see the top deck and know how many stories it is, then you can find a rough equivalent to the same amount of surface parking. Where a garage is underground or on the lower floors of a taller building, it gets much more complicated. It does matter though, because the more parking there is, the more traffic there is likely to be on the streets. On-street parking would require a much more fine-grained approach, and would be quite difficult. Much parking (especially here in Cincinnati) is peak-restricted. So most downtown streets which are 40' curb to curb may have only two through lanes for much of the day with parking on either side, but then it becomes a 4-lane highway from 7-9 AM and 4-6 PM. Most major roads outside downtown have similar restrictions, though only inbound in the morning and outbound in the evening. Then there's loading zones, taxi zones, bus stops, etc., that can be very difficult to figure out from overhead. @Jeffrey: Garage parking definitely is a challenge. Washington for one clearly has a vast amount of parking in underground garages. My intent here was only to estimate the surface area of the city devoted to parking, rather than the total number of parking spaces, as Garrick and McCahill have done in their studies. 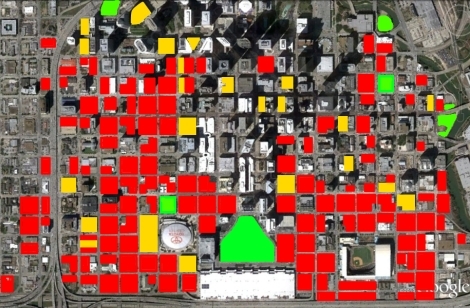 It's a land use analysis more than than a transportation analysis. And even measuring that is not necessarily straightforward -- some parking garages have street level retail, for instance. What also would be useful is simply finding how much paved surface (not ROW land) is devoted to the vehicle. On that measure it looks like Portland and DC (and probably Savannah), which are ROW rich, actually have greater building footprint than other grid cities. 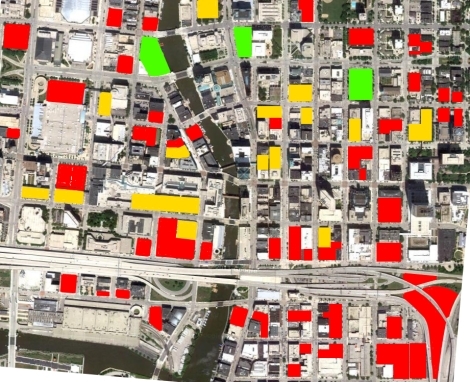 With their abundance of right-of-way and smaller blocks, it is just too costly to concede land to surface parking. In Portland, developers need structured parking to accommodate vehicles in small blocks, and this requires a dense program to pay for it. In these cities there is therefore greater incentive for owners of surface lots to convert to higher and better uses. I wouldn't be surprised if they exhibit the same or even greater overall density per square foot of asphalt than most cities. These are exactly the kinds of analyses we need to be crowdsourcing! I agree with your comment about block size, and would add that DC and Portland both share height limits (Portland somewhat less so, although much of the downtown is limited to 130'), which also tend to reduce teardowns and speculative holding of vacant land for future skyscraper construction. I agree, also, that crowdsourcing really is the way to go here. The thread over at Skyscraper Page generated maps for a dozen or more cities, which would have taken one person many hours to do. I like your post and thanks for sharing it. Don't forget our successful Metro. The Metro is the key to all planning successes in our region. You can't underestimate the power of being able to move up to 1 million people car-free every day (current average weekday ridership is about 800,000). People don't need cars to move around inside the Beltway and when people from far-flung locations come in they often park at the end of a Metro line. Demand for parking is high, but is highly offset by transportation that does not need parking at the destination. Hundreds of thousands of people who live inside the Beltway in both D.C. proper and the inner suburbs don't own cars because they simply don't need them. Take a look at what D.C. looked like between the destruction of the 1968 riots and before the Metro was completed. It looked a lot more like Houston. Once the whole Metro system was completed in 2001, it quickly started to look more like today. The City Center site was the site of the old Convention Center before the current one was opened in 2004. The fact that the land was city-owned, combined with its extremely high value, and prominent downtown location, combined plain-old red tape was the cause of it taking so long to redevelop. It wasn't due to lack of demand. It was due to the opposite problem of the city having the luxury to be extremely choosy. Cavan -- that's a great point. I have seen some aerials of Washington from that era (1960s-1980s) and there do seem to be large swathes of surface parking. As for the metro-less scenario, I think it is more likely that the amount of office space constructed in the District simply would have been much less, with new development displaced to the edge cities to an even greater extent than we see today. On the other hand, I've never seen a figure for how much garage parking currently exists in the city's underground garages. I suspect the amount is very large. DC's remarkable achievement is that nearly 100 percent of downtown parking is below ground level. The metro enabled that result, but I think there is also a strong incentive resulting from the height limit and the exemption of underground parking from FAR maximums. 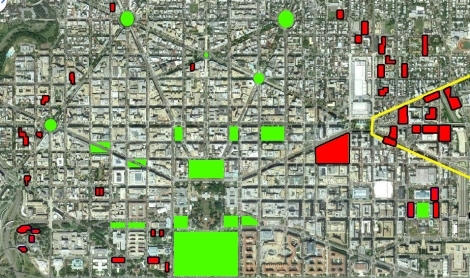 Since builders cannot compensate for large above-ground garages or surface lots by building skyscrapers, it may be most cost effective to locate all parking below grade. I really enjoyed the charts on automobile ocupation. I've been doing similar work in my blog: planodosautomoveisbrancos.wordpress.com.br. The blog is in portuguese (I'm from Brazil), but it's fairly easy to understand the 'mote', since it's based on images. Skyscraper Page is for what? It's show how much space utilizes for Commercial Parking. Sometimes, Peoples lies, that they not found the parking space for any event. But actually, they are trinig to save money, not spending at parking places. Your thread is very good, keep it up! I love so high quality threads, it gets your domain look good. Find out how get top eleven football manager hack and it has top eleven token hack. Visit top eleven token hack to find splendid top eleven hack. And you can get much awesome top eleven cheats. The diagram above provides a very useful guide for motorists, you can visually tell where to park, I wonder if these can be integrated into google map for smart phones. Commercial parking space should be available in every city to meet the needs of businessmen or other people. You have given an important chart in this blog. I just adore your website. It helped everyone obtaining a lot of details. Many thanks completely and also continue the good work. This is great and very colorful Parking Gatwick submission. commercial parking should be there to make the surroundings least congested,Airport Car Parking UKis all about providing healthier ways to provide a certain to every one who want to aspire safe, sound and reliable parking options. Can you tell me more about how you calculated these? I'd like to do the same analysis for Oakland, CA. My methodology for these examples was fairly crude, just using a freeware paint program (Paint.net) that allows the user to calculate the area, in pixels, of the areas marked in solid color. I created new layers for each color, traced in the colored areas, measured their total area, and expressed this area as a percentage of the total map area. FYI, with this method, area is measured by holding the Control key and successively selecting each area. airport parking gatwick offers reliable parking options for you to avail all the benefits in your travels. Very complicated but informative blog based on deep knowledge and experience, it seems like blogger have made a lot of research and defined automobile occupation charts broadly. meet and greet parking gatwick can take you to the heights of satisfaction and gladness by its valuable parking services. Really, I was waiting for this post. I read your post you are providing parking service in Houston city. Covered parking price differ from uncovered at Airport parking Houston. A great deal over some other providers. I got some useful tips from this post.Thanks for sharing this. quran memorization, quran tajweed classes, Online Arabic courses and more with one on one live Quran teachers at their convenient days and time. If you are looking for high quality and low price used vehicles company is Drive with Prid used cars Houston Texas. We offer Manchester airport meet and greet service i-e to collect car from airport terminal and drop the car back again at air port terminal. Thanks for sharing such an awesome content. My blog is in the exact same area of interest as yours and my users would definitely benefit from a lot of the information you present here.